LONDON (Reuters) - Rival versions of the world’s top-selling drug, AbbVie's Humira, went on sale in Europe on Tuesday, years ahead of similar cut-price copies being available in the United States. Amgen is rolling out its so-called biosimilar form of Humira, branded as Amgevita, across Europe from Oct. 16, while Novartis said its Sandoz unit was launching its product Hyrimoz initially in Britain, with other markets set to follow. Large sums are at stake, since Humira clocked up worldwide sales of $18 billion last year, of which around $4 billion came from Europe, and European healthcare administrators are eager to exploit the competitive situation to drive down drug bills. 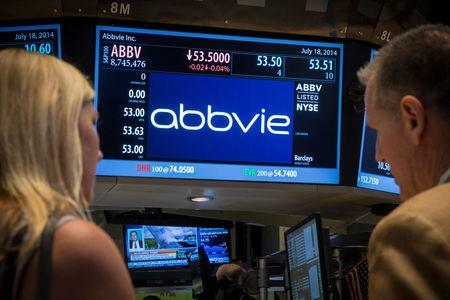 The U.S. healthcare system, however, is not expected to see Humira biosimilars until 2023, due to a raft of patents protecting AbbVie's market position. That should keep Humira's global sales growing for the next four years, despite European losses, according to consensus analyst forecasts. Humira, used to treat rheumatoid arthritis, Crohn's disease, ulcerative colitis and psoriasis, is not only a big cost-saving opportunity for health services, it is also the number one target for companies manufacturing biosimilars. Two further copies of the medicine are expected to be launched shortly by Mylan and South Korea's Samsung Bioepis. A fifth Humira biosimilar from Boehringer Ingelheim, which the German company had planned to sell in Europe, has been held back due to patent litigation, a spokeswoman said. Biosimilars are near-copies of original biotech medicines, but because such drugs are made in living cells they can never be wholly identical. As a result, they require more extensive testing than true generics, which adds to development costs. For the moment, Amgen and Novartis are not disclosing the price they will charge for their Humira copies, although an Amgen official said there would be cost savings for patients, hospitals and health systems. The pace of biosimilar use is likely to vary from country to country across Europe, as has been the case with earlier copies of antibody drugs such as Remicade and Enbrel - two rivals to Humira from Merck and Pfizer - and Roche's blood cancer drug Rituxan/MabThera. Scandinavian countries have a track record of early biosimilar adoption and Britain has set a target for 90 percent of new patients getting the "best value biological medicine" within three months of the arrival of biosimilars and 80 percent of existing patients within 12 months. In the case of Humira, UK health authorities told administrators earlier this year not to sign any new contracts that extend beyond Oct. 16 – the expiry date for Humira's primary European patent.